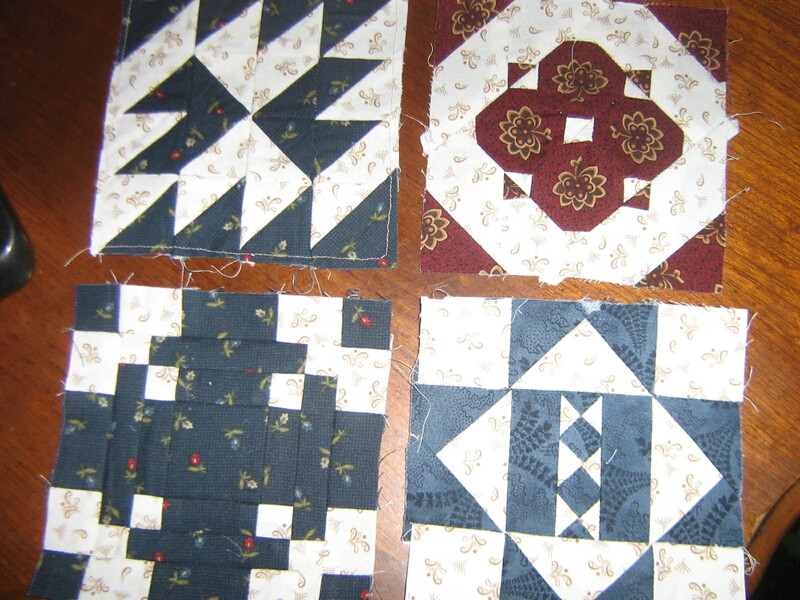 During December and January I finally worked on some of the 4 1/2″ blocks for my Dear Jane quilt. 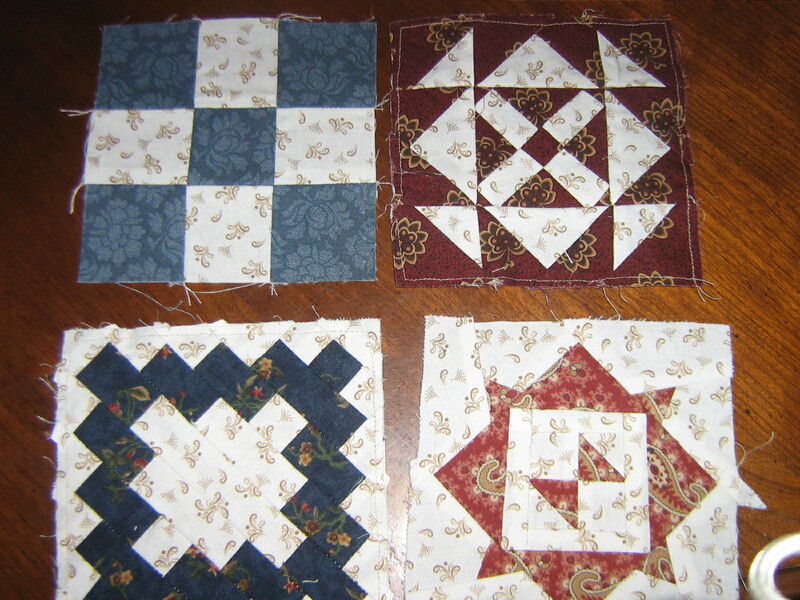 I finished 11 blocks and have many more started. Now I just have to find the time to finish some more! The past month and a half has been filled with MANY projects. Unfortunately, most of these projects were for clients and not for my family and friends. The good part is that our adoption fund has more than $1,000 in it. It’s a drop in a bucket compared to all that we will need, but it’s a wonderful start! Here are most of the projects I made. I also made a paw print/dog bone cape. 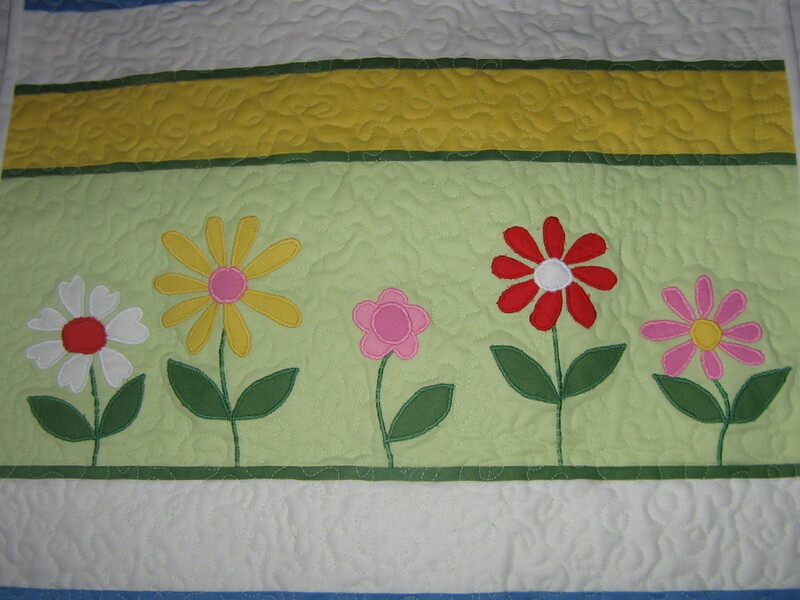 My favorite project was a crib size quilt that I made out of a little girl’s baby clothes. I forgot to take any pictures of it, so hopefully the client will send me some. 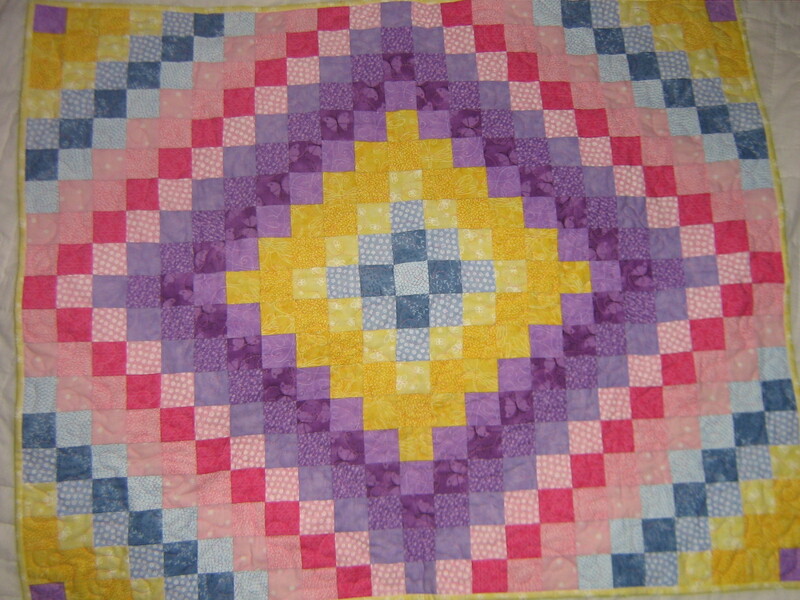 A quilt for an American Girl doll bed. A memory quilt I made from a dad's shirts. 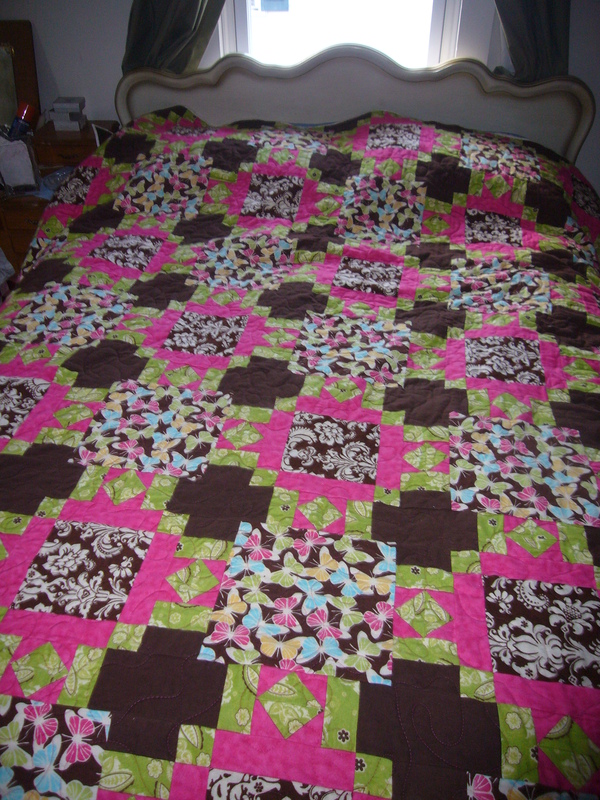 I made two of these quilts for her sisters. 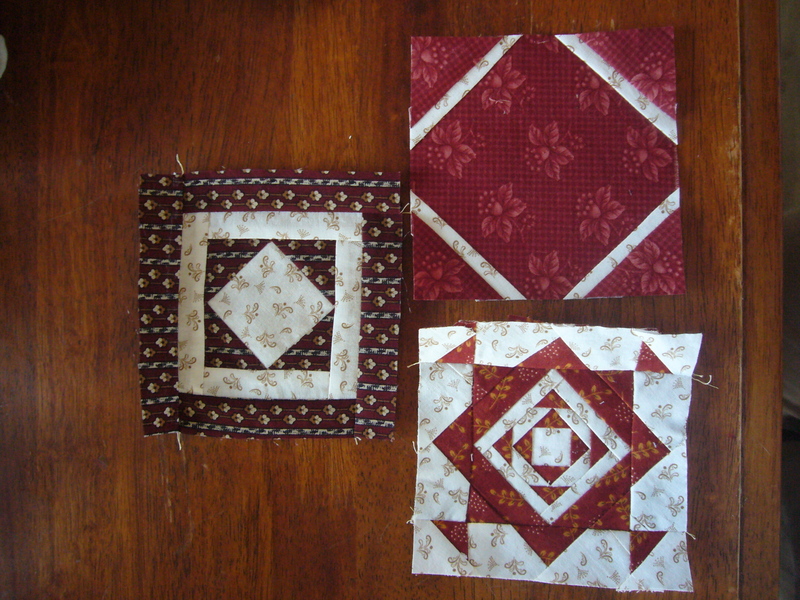 For the client and her mom I am going to make pillows. 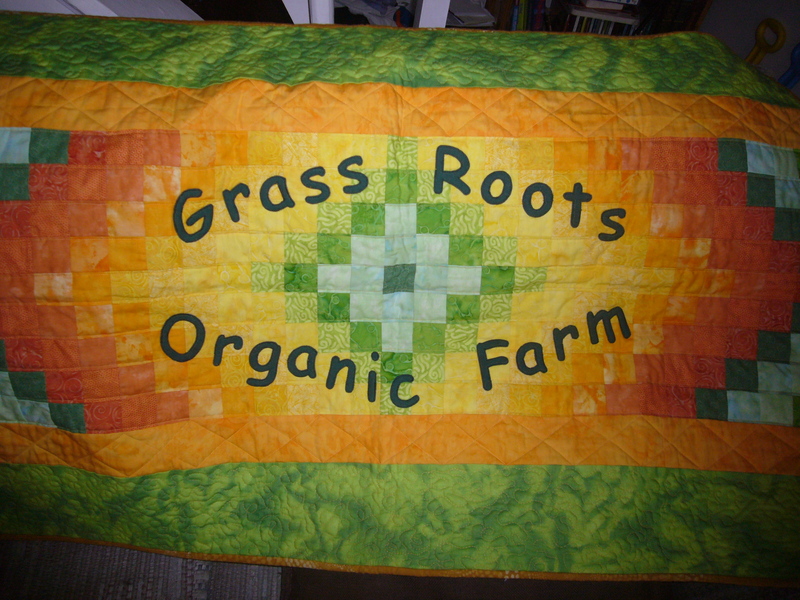 My friend, Diane had this quilt at her craft stand at the Selinsgrove Farmers Market. Another vendor saw it and wanted to use it as the sign for his business. 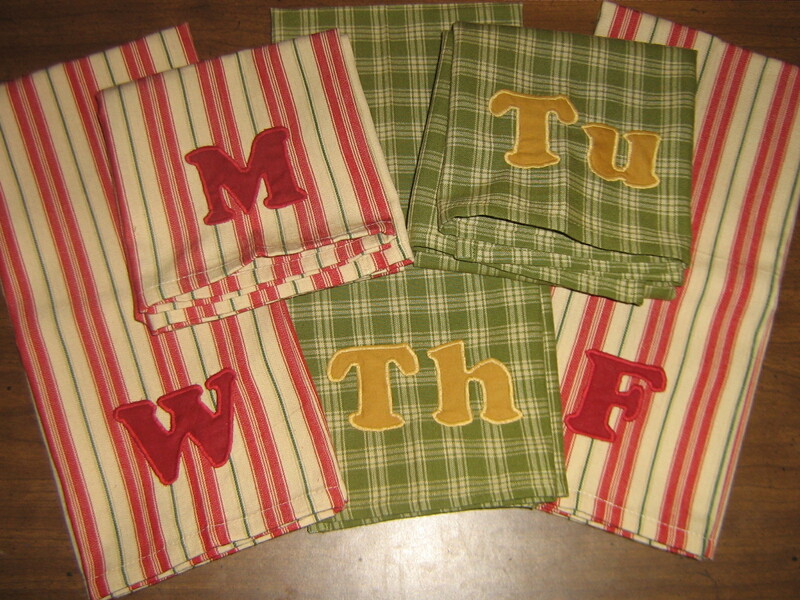 I used heat n bond to get the letters to stick to the fabric. Then I stitched around the letters to make sure they never will come off. I was very happy with the way it turned out. I only finished one block when we were together. It is block A-4, Courtney’s Stethoscope. It really wasn’t that hard of a block. It took me about two hours to complete it because all of the pieces are cut out with scissors instead of using a rotary cutter. I’m looking forward to working at least a little bit on the blocks everyday. I may even get caught up by the end of the summer. I’m only about 60 blocks behind where we are supposed to be. 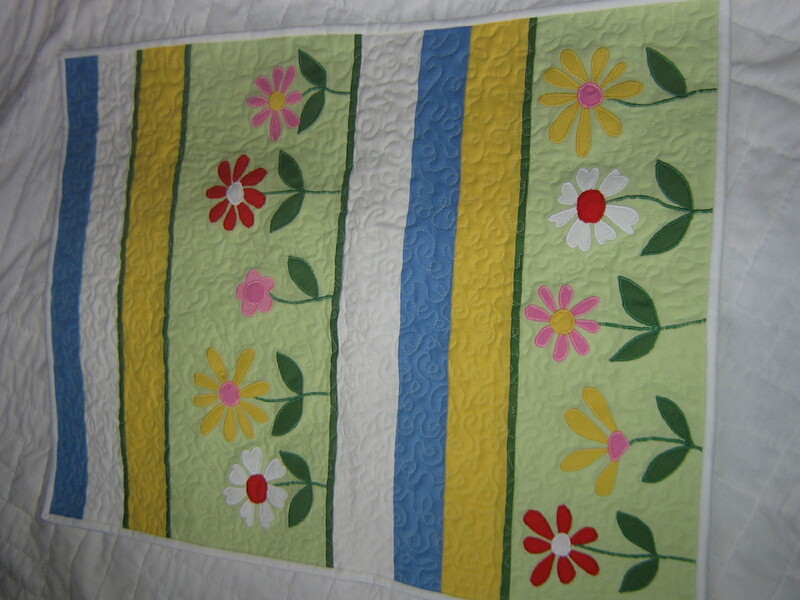 In October 2010 I joined a group of women who was meeting together to encourage each other as we all made our own Dear Jane quilt. It seems kind of silly- a quilt support group? But this quilt is no normal undertaking. The Dear Jane quilt is made up of 5″ square blocks and you need 225 of them. 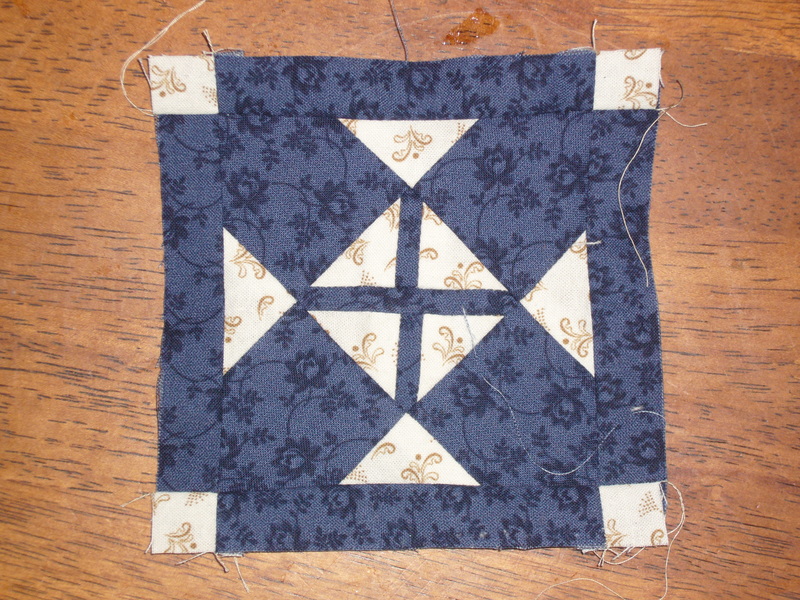 And the beautiful scalloped border contains pieced triangles. Yesterday my friend, April came over and we worked on our blocks together. It was kind of a mini support group. We decided to get together every month and work on blocks together. 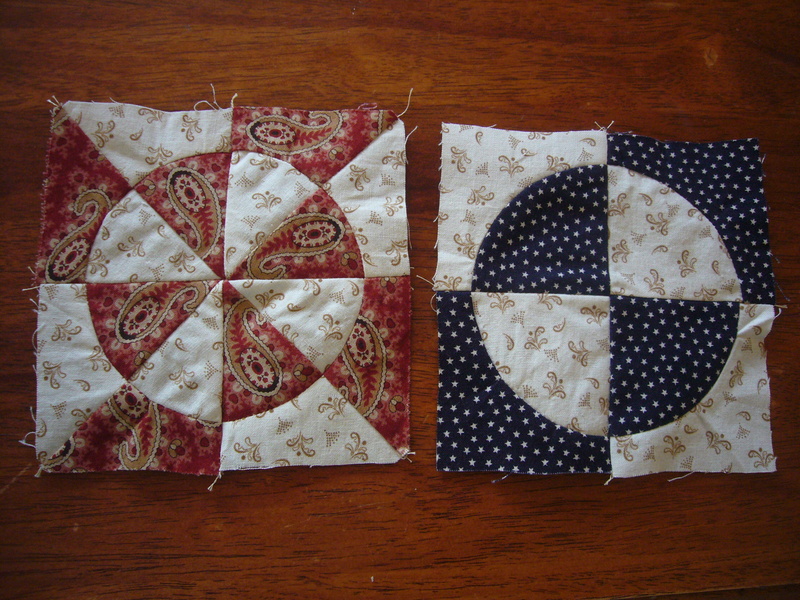 I finished two blocks in our 3 1/2 hours together. 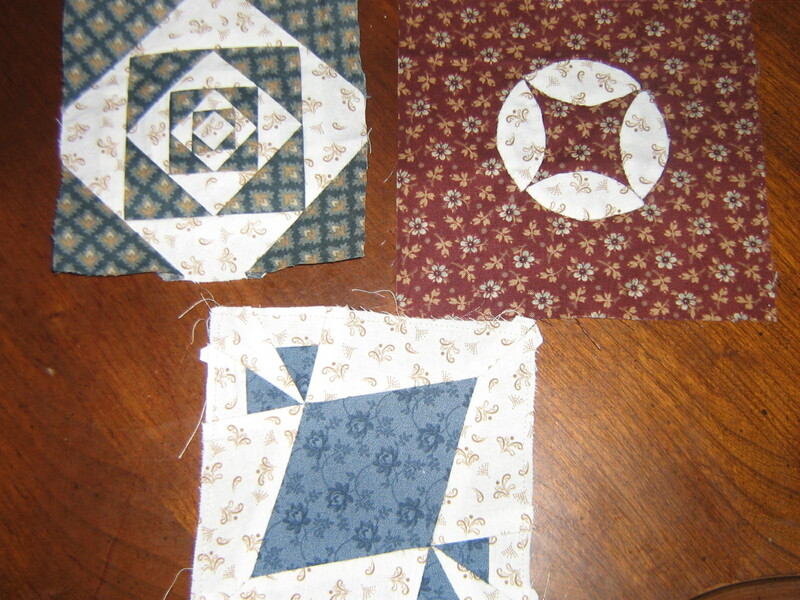 After the kids went to bed I worked on three more blocks, which I finished this morning. So here are pictures of what blocks I finished over the past few days. Later I’ll post pictures of the blocks I’ve already finished. 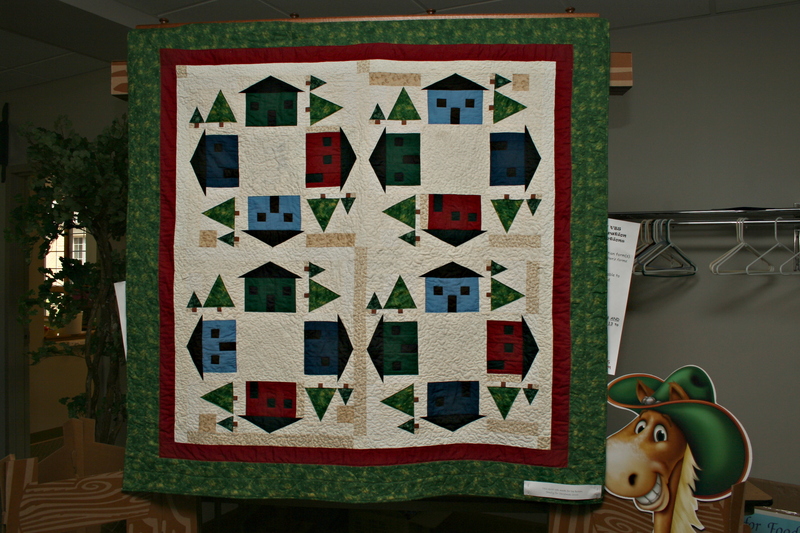 This house quilt was made for the Bohan family several years ago as a Christmas gift. I have since made them a matching pillow. 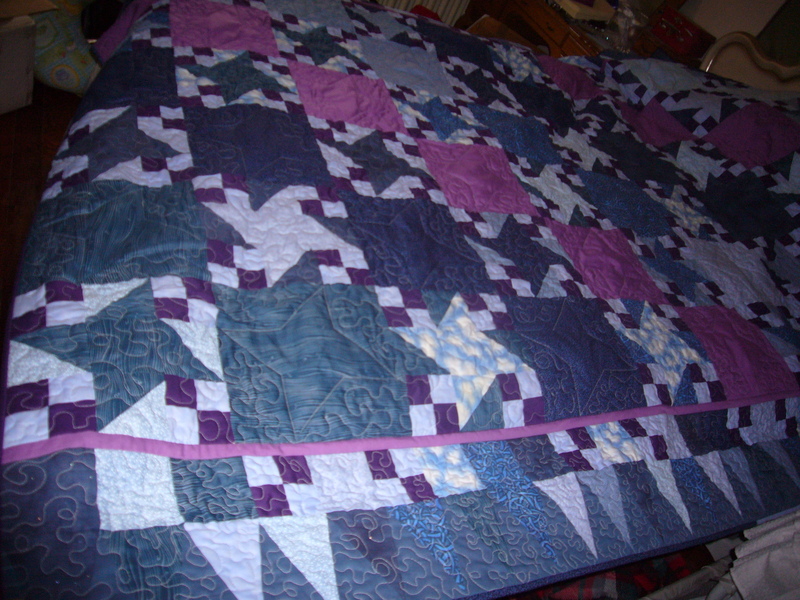 It is hand and machine quilted.Jefferson had started making the top of this quilt many years ago. 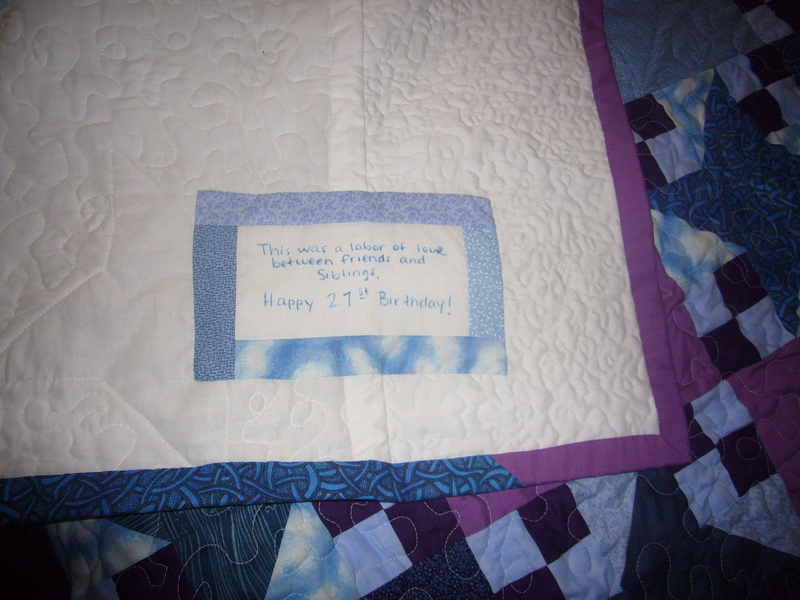 His sister Kiera had worked on assembling the top and started quilting it. Karen (their mom) asked me if I would finish the quilt for them. 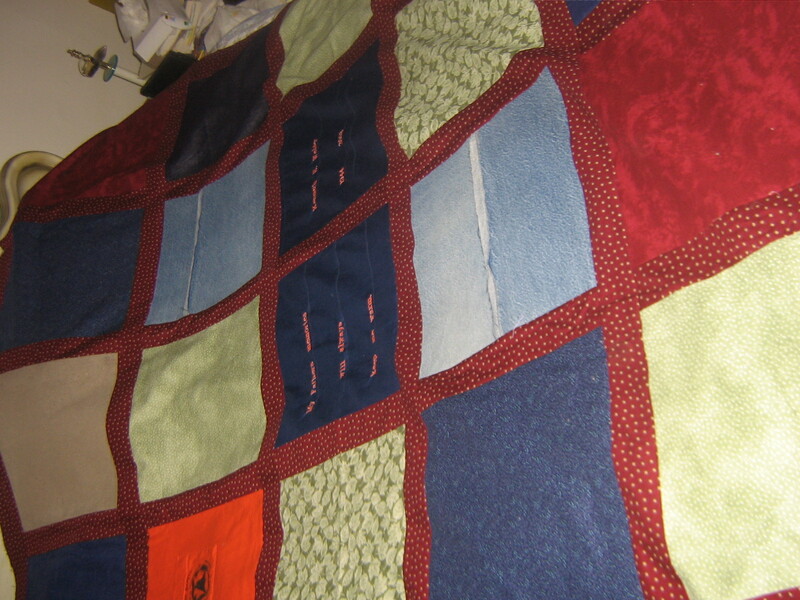 I added borders, machine quilted it and added binding. 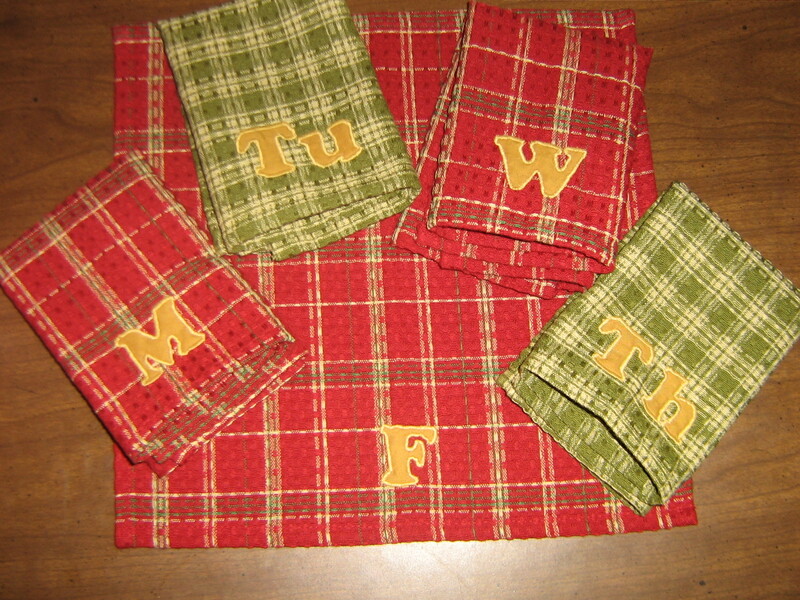 I designed the borders using the leftover fabric from the top. Luckily they had plenty of extra fabric. I really like how it turned out. Karen came up with this great label to put on the back of the quilt I was finishing for her son, Jefferson. 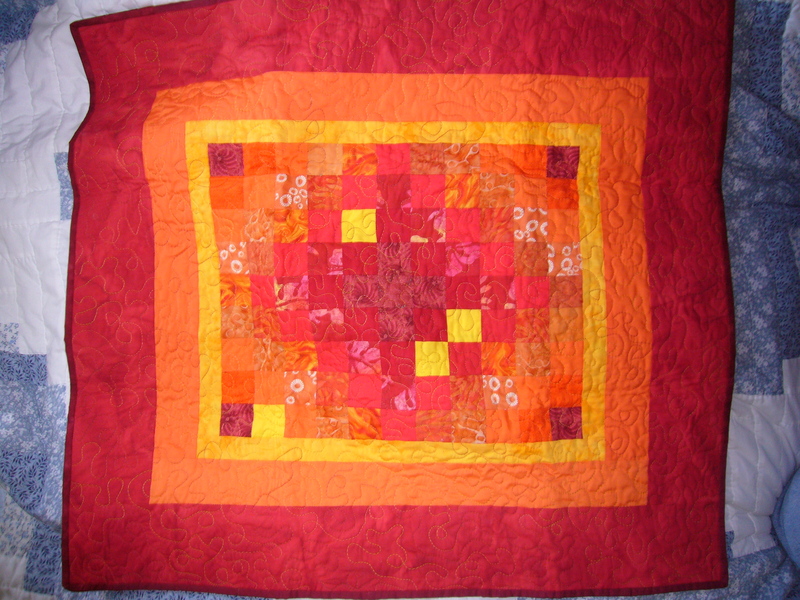 It is made using leftover fabric from the quilt top. 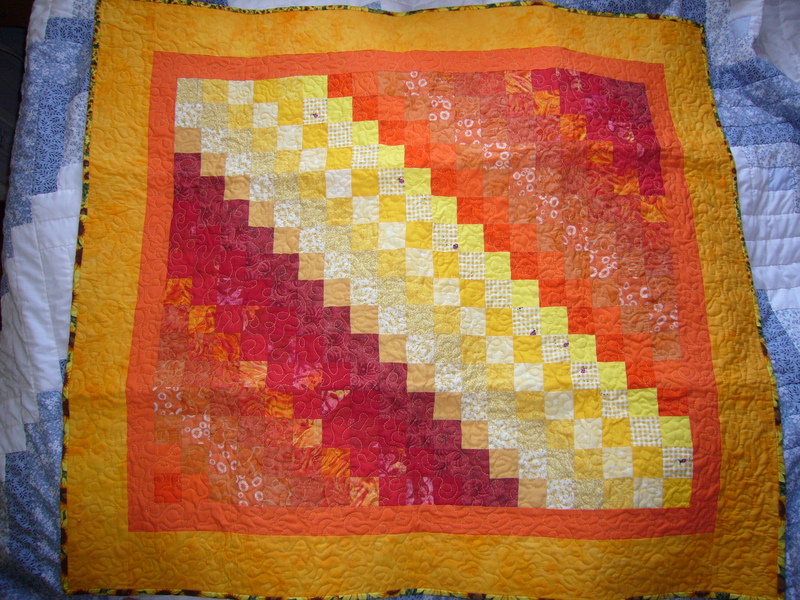 This is an "Around the World" baby quilt. This is a picture of Calvin when he was 5 months old. He is sitting in the basket with the first around the world quilt I made. 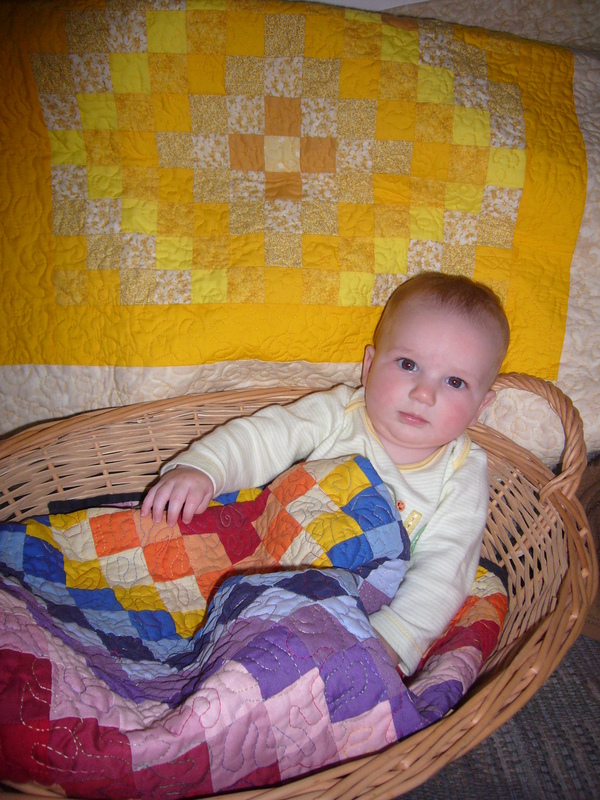 A baby quilt, using the same design is on the couch behind him.